I’d configured the FTP server to use a certificate from an internal CA, but the FTP clients don’t trust it, presumably because they don’t use the Windows certificate store. That’s good to know, and now that I know the cause I can focus on that (rather than wasting my time looking at firewall settings). I also have the option to continue. However, it falls down in a few areas. The organisation, unit, and country shouldn’t be blank; I know for a fact that both certificates (FTP server and issuing CA) include that information. Also, the valid from/to dates are in American format (mm/dd/yy). I’m in the UK, and I’ve configured my PC to use the ISO 8601 date format (yyyy-mm-dd). FileZilla picks up my regional settings, rather than hard-coding the USA settings, which I appreciate. 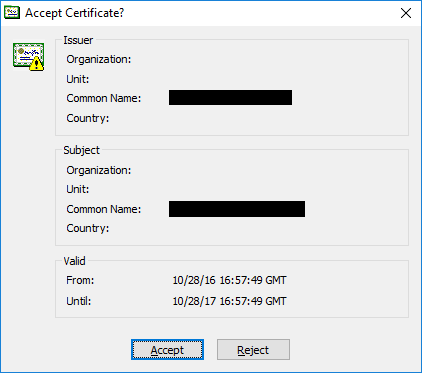 CuteFTP 9 displays the certificate, asking me to accept or reject it. 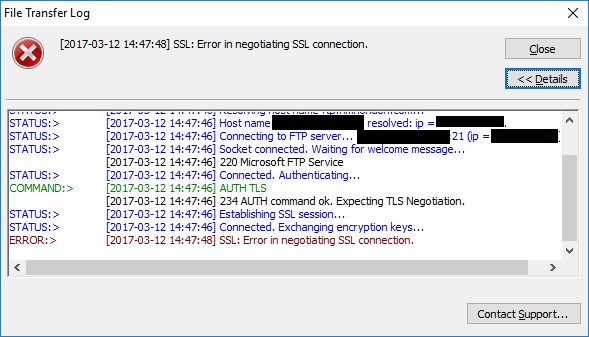 FileZilla displays the entire certificate chain, asking me whether I want to trust it (either permanently or just for this session). In the Global Options window, under Security, select SSL Security. 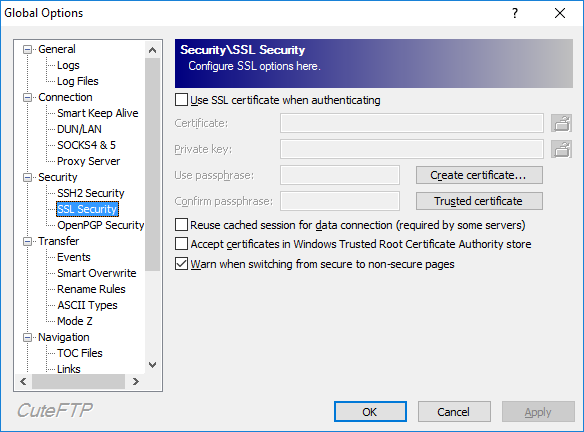 If you tick the Accept certificates in Windows Trusted Root Certificate Authority store box, CuteFTP 9 will connect to the site without any prompt. However, CuteFTP Pro 8 still gives the same error message as before! 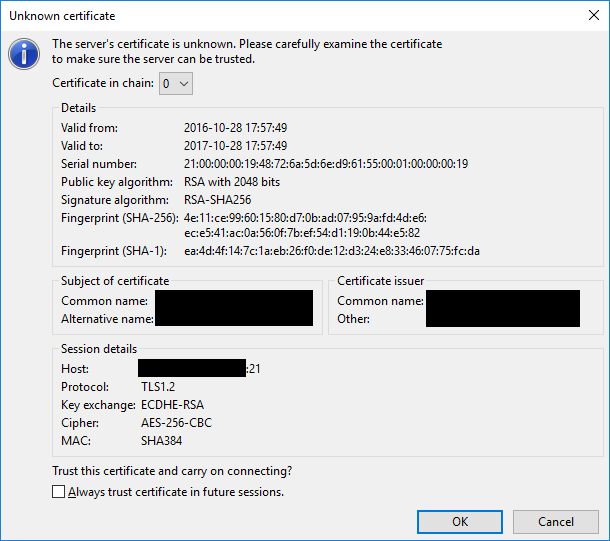 It might be possible to explicitly import the server’s certificate, but that relies on you having a copy of the file, which typically won’t be the case. In practical terms, I would say that CuteFTP Pro 8 is unusable with FTPS. Personally, I would like to trust all certificates from a particular CA rather than having to review the fingerprints every time I connect to a new server, so I think that CuteFTP 9 comes out ahead here. However, it’s no worse than checking SSH keys for SFTP sites. Another issue is IPv6 support (or the lack thereof). For the purposes of this test, I’m specifying a literal IPv6 address, but the same issue applies if I disable IPv4 on my internet connection and then use FQDNs. I’m also connecting to a different server which uses SFTP rather than FTPS. The IPv6 RFCs were published in 1996, so this protocol has now been around for 20 years, and it’s high time that software developers supported it. Looking around GlobalScape’s website, the only mention I’ve found is this (archived) page: Transfer Settings. So, they’re aware of IPv6, but haven’t implemented it. As a minor point, I also noticed that CuteFTP is only available as 32-bit software, whereas FileZilla has 32-bit and 64-bit options. Realistically, I don’t think an FTP client should ever need to access more than 4 GiB of RAM, but I’d say that it’s worth compiling an extra version anyway. Finally, the most obvious difference between the two clients is that FileZilla is freeware, whereas you have to pay for CuteFTP. In my case, that’s not actually much of a motivation; I’m willing to pay for software that I use on a regular basis. However, given the difference in functionality, it makes more sense for me to donate some money to the FileZilla project rather than paying to upgrade CuteFTP.